O "Idol," why hast thou forsaken me? I had such high hopes for the ladies tonight, and just like the guys on Tuesday night, the women stepped it up a little bit. And just like with the men the first performance was the best. MamaSox rocked the house and I enjoyed a few others, but I have yet to see someone I feel like can be anointed as "The Chosen One." This early in the game, shouldn't we at least have some inkling of some of the major contenders for "American Idol"? How long must we wait before somebody really breaks out and has a "moment?" 9:51 p.m.– Siobhan Magnus was feeling less "Twin Peaks" to me tonight. She's an interesting girl though, that's for sure. She did not have the pipes for Aretha Franklin's "Think." That song is all about the attitude, and despite the big note at the end the performance was just too ... nice. Randy said it was "dope," which made me wonder if he was on that. I think these judges have been lulled into some type of weird trance where they are grasping for somebody, anybody to be fabulous. 9:39 p.m. -Warning to my boss: I'm going to start bringing a coloring book to work. I remember that being a stress release for me back in the day, so Paige Miles may be on to something. I like her voice, but it's always tricky to tackle a Kelly Clarkson song on "Idol." She brought some big notes though and that's what "Idol" loves. I didn't know that Kara wrote "Walk Away." The song is hot and Paige worked it out a little bit. 9:27 p.m. – They got that big piano out there quickly for Katelyn Epperly. Minus the attempt to "connect" with us at home by staring longingly into the camera, her "The Scientist" was a great song choice for her. Nobody can do it like Coldplay's Chris Martin, but she did it justice. I agree with Ellen that it was slow because DUH, it's a slow song. Ellen's humor was slow too. The unfunny jokes at the wrong time are just adding to the uncomfortable vibe of the show tonight. 9:17 p.m. -I think Sam Cooke's "A Change is Gonna Come" should be added to a list of songs like "At Last" that contestants are barred from singing. The original version (with its incredible arrangement and vocal) is so powerful. Lilly Scott gets points for attempting it. She didn't smash it by any means. It was quirky and unique.But I didn't have the "moment" that Kara claimed. I wonder if Lilly is shining so much for some of the judges because there has been so much suckage thus far this season. 9:04 p.m. – I have a homeboy who I pray is watching "Idol" tonight. I used to torture him back in the day by singing Creed's "With Arms Wide Open." It's one of those songs that you either really like or it really annoys you. Such a weird choice for Michelle Delamor. She should have stuck with an R&B vibe or something pop, instead of trying to make Creed funky/jazzy. It was just wrong on so many levels! What were the judges listening to? Kara and Simon liked that? And a shout out to Vera Wang? Has the whole world gone mad?! 8:52 p.m. – Why is Seacrest stalking Didi Benami? He was watching her while she was watching the judges on Tuesday night? Creepy! Former mascot Didi meowing before performances just begs mockery, but I won't go there. I wonder if people choose "Lean On Me" because it guarantees a hand clap that might distract from the actual singing. This was one of the most boring versions of the song I have ever seen before in my life – even with her runs at the end. I've seen high school talent show versions of that song which were better than Didi's. I do feel bad for her because I thought she was going to totally break down and swoon all over Seacrest. And I think I'm catching the vibe of the judges: Randy speaks, Ellen nicely disagrees, Kara tries to build on what Randy just said and then Simon comes in with something brutal that the audience boos. Is it me or is the judging sucking almost as bad as some of the singing? 8:42 p.m. – Katie Stevens is one of my favorites this season. I love the tone of her voice. I do, however, need somebody to check her birth certificate to verify that she is a teen. She reminds me of Jo Jo with that "grownish" voice coming out of her little girl face. Plus I love the fact that she grabs the mike like she owns it. I enjoyed her version of "Put Your Records On" once she warmed up to it. And please stop telling her to young it up! She has a sophisticated sound and she doesn't have to start singing Disney tracks for America to love her. 8:28 p.m. – Are we literally watching paint dry with Lacey Brown as she refurbishes furniture? Note to contestants: do not take song choice advice from Kara. "Kiss Me" is a fun song and it seemed like it should have suited Lacey's voice. But there was a disconnect somewhere. Her voice didn't sound very strong or controlled. She's a cute girl, but I don't see her as the next "American Idol." P.S., I stand corrected in that Kara said Haeley had the "Alex Lambert effect." (Thanks Dana and Sam.). I am clearly yearning for Adam Lambert! 8:16 p.m. – I prayed that we would be able to avoid Miley Cyrus this season. Guess not. Haeley Vaughn's mad face scared me - and I could have bet that she made hair accessories. There was a girl I went to college with who did the same thing and she always looked like something was growing out of the side of her head. Haeley's version of "The Climb" was actually less country than I thought it was going to be. And it was bad. And no, Kara didn't say she had the "Adam Lambert effect," did she? Here's what irritates me too - if she needs a year to "strengthen her instrument," as Kara said, why did the judges put her through to the Top 24? 8:05 p.m. – I know the producers want us to learn more about the contestants but these little personal asides aren't doing much for me. First up is MamaSox. I'm digging Crystal's vibe and she took "Long As I Can See the Light" to church. Like Big Mike last night, she set a nice tone for the beginning of the show. She connected with the song, it was authentic and I believed it. The judges are practically kissing her feet. Ellen is really starting to bug me in that she is adding absolutely nothing in terms of critique. Tim McGraw is no stranger to philanthropy. The Grammy-winning country star has done benefit concerts and other charity work for years, and in 2004, he and wife Faith Hill founded Neighbor's Keeper, which funds local organizations assisting communities in need. The latest recipient of his determination to help is Operation Homefront, which supports U.S. troops, veterans and their families. McGraw has recorded a public service announcement for the non-profit, and T-shirt sales on his current "Southern Voice" tour will benefit the group. McGraw's tour sponsor, Outback Steakhouse, is spearheading the campaign, pledging $1 million to the organization. It's hardly the first time Outback has dished up support for the military: over the past eight years, the restaurant chain has provided meals to more than 150,000 U.S. troops around the world. That's a lot of Bloomin' Onions! If you're moved to add your voice to theirs, you can donate directly by texting "HERO" to 50555. How will the women do on "American Idol"? Let's see how they do. Last week, the ladies were better than the men - but that's not saying much. The men (some of them, anyway) improved this week; we'll see if the women can do the same. As of late afternoon, reports were that Crystal Bowersox may still not be well enough to perform so we'll have to wait and see how it goes down. Not sure how "Idol" is going to handle this one. 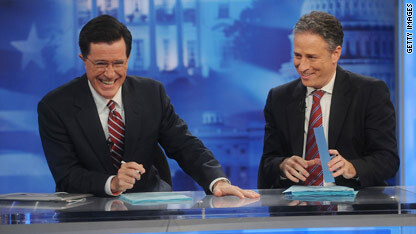 Comedic television hosts continue to be at the center of programming battles as Comedy Central, owned by Viacom, Inc., has decided to pull "The Daily Show with John Stewart" and "The Colbert Report" from Hulu.com, according to The Wall Street Journal. Backstreet’s back, alright – and this time, they’re on a boat. The boy band released news that they’re kicking off a four-day cruise at the end of the year, departing from South Florida on December 9. The actual ports of call have yet to be described in more detail other than "exotic," but according to the band’s Web site, cruise participants will be treated to “an intimate” performance from Backstreet, a Q&A session, photo ops and a beach party. Tickets for fan club members go on pre-sale March 15, with public sale beginning March 22. You have to buy your tickets through the official site, unless you want to run the risk of being left out of the “private” events.